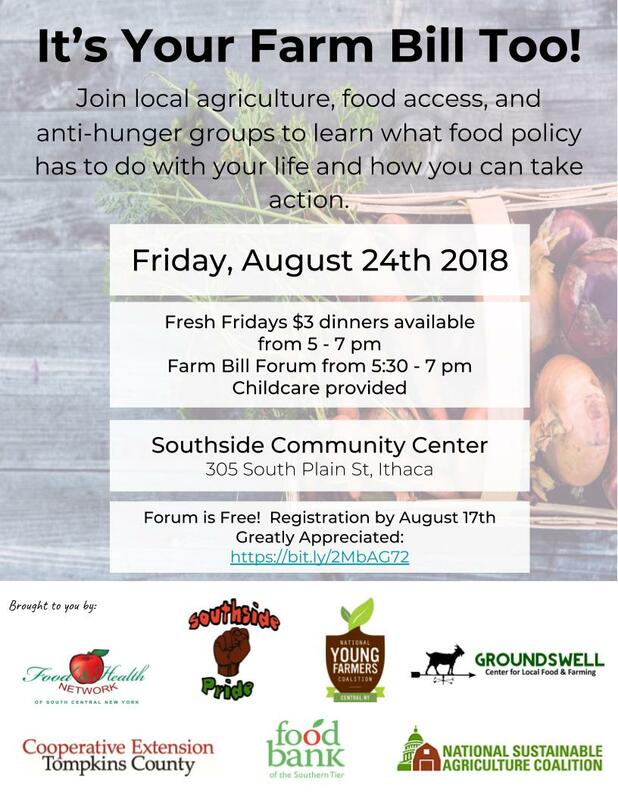 Join local agriculture, food access, and anti-hunger groups on Friday, August 24th at Southside Community Center to learn what food policy has to do with your life and how you can take action! Download and share the event flyer below. Forum is free! Childcare is provided. Registration by August 17th greatly appreciated: Register Here! The event is hosted in partnership by the Food Bank of the Southern Tier, CCE-Tompkins, Food & Health Network, National Young Farmers Coalition – Central NY, National Sustainable Agriculture Coalition, Groundswell Center for Local Food & Farming, and Southside Community Center.